I’ve had an idea for my January journal quilt page that I would like to run by you. 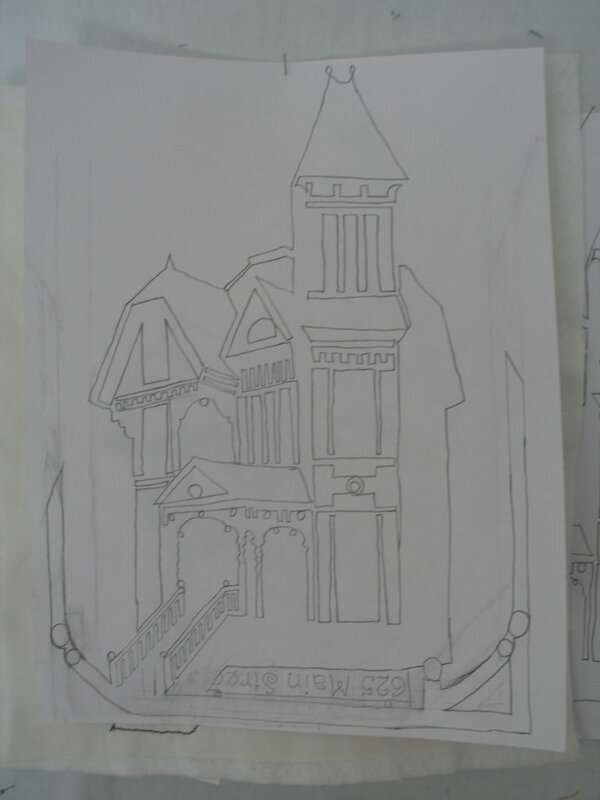 I was thinking about adding a border around the whole drawing but I didn’t like fencing in the top of the tower. It looks like it is reaching up to the heavens and I don’t want to restrict it from that. So I started just sketching the border around the bottom. The border started looking like the spandrel on the porch (the decorative work spanning between the posts). Additionally, I was thinking of using the address as the title of the page so I was trying to figure out where I could put it. Then I had this idea…break the spandrel posts, turn it upside down and put the address, upside down, like it had been hanging between the posts. Breaking the posts and turning it upside down symbolize the fact that the house was demolished and no longer stands. Is this just too weird? I’m a little uncomfortable with it but I don’t know it that is because it doesn’t make sense or if it is because I don’t usually put symbolism in my work. So, what do you think? I like the idea of leaving the top open, the address somewhere and the spandels (?) along the edge. Try some arrangements and go with one you like. . .you can do another one next month. Or, have a bunch of Jan pages (you are not limited to one Jan page). I agree, and I like the idea of indicating the fact that the house no longer stands. Yes, what they said, and NO, not dorky at all! I love what you are doing. Symbolism seems to be creeping into the work of those of us who haven’t thought about it in the past. That’s probably a good thing. Now I have to figure out how to add your blog link to my list of favorites. I like the idea of having the address be the title of each page, since you will be doing a series of buildings. I also think it would be very cool to have some architectural element from each building repeated in its border. About the symbolism – I’m not sure I would “get it” if I just saw it, but it doesn’t hurt to have something there in an aritistic work that not everyone “gets”. So, if you like the idea, do it! I love the idea of repeating or reinterpreting an architecture element as a frame and I don’t think it has to go all the way around, either. I like the idea of including the address and I like the idea of finding away to symbolically indicated if the building has been demolished … but I wonder if there is some other way (besides turning text upside down) to indicate that? Deb – I think your idea is fabulous! I love the border you have in mind and the address incorporation too. Don’t you just love when you get these kind of “break through” symbolisms? Cool beans! I think your ideas sound great and I can’t wait to see it.